Nothing upstages pumpkin pie in my book. About three weeks before Thanksgiving, I find myself drawn to every magazine at the grocery store. “Your best Thanksgiving Ever!” (Yes!) “A Pumpkin Pie to Wow Them!” (Of course!) “The Best of the Best Pie Recipes for Your Table!” (This is the one!). And every year I set out to find the best pumpkin pie recipe – one that people will talk about for years to come. It never fails, the chosen recipe tastes like, well…pumpkin pie. I was starting to feel like Linus waiting for the Great Pumpkin to come, each year hoping that the recipe Gods would pick me as the most sincere baker of all. That is until last year when Dorie Greenspan and her Caramel Pumpkin Pie entered my life. If you own only one baking cookbook, I say it should be Baking: From My Home to Yours by Dorie Greenspan. She’s the author of Baking With Julia (yes, Julia Child) and knows her stuff. 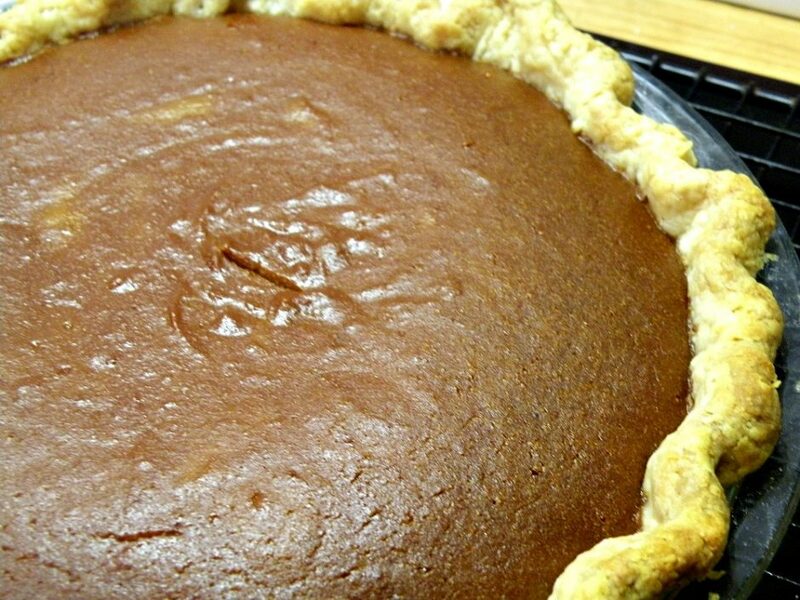 Her technique of caramelizing a portion of the sugar before adding it to the pumpkin mixture gives this pie a depth of flavor that will knock your socks off. It’s like a pumpkin pie has hit puberty – that soft, sweet, creamy pastry grows up to be a deeper, darker, more mature dessert that means business. If you’re like me and always looking for that next best thing – this is your year!! This recipe takes a little patience with an extra step of using a deep caramel sauce that you make on the stove. The process makes you second guess yourself, but give it some patience and it will turn out great! Make pie crust and refrigerated for at least an hour. This can also be done a day ahead of time. Roll dough into a 13 inch circle and place into a 9 inch pie plate. You will want to leave a one-inch over hang by cutting the dough to even it out. Tuck edges under and sculpt an upstanding ridge if desired. Optional: Partially bake crust. Sometimes I just don't want to spend the extra time, but if you want to really get your crust crispy you should partially bake the crust. To partially bake: Preheat oven to 425 while you are plating the crust. Line crust with foil, covering the edges as well. Place pie weights/rice/beans into the pie plate. Bake pie for 20 minutes. Remove from oven and take off the foil. Pierce the bottom of the crust with a fork to let out air pockets and return to the oven for 8 minutes until just starting to brown. Cover edges if starting to brown too quickly. Cool completely before placing the filling and baking the pie. If you pre baked the crust, make your filling while the crust cools. If you did not pre bake your crust, keep the plated pie pan in the refrigerator while you make your filling. Preheat the oven to 350. In a large non-stick skillet or small pan, sprinkle 1/2 cup of the sugar evenly and cook over medium-high heat without stirring. Continue to cook the sugar until it starts to turn a deep amber. This is the fun part. It will start to bubble and foam. 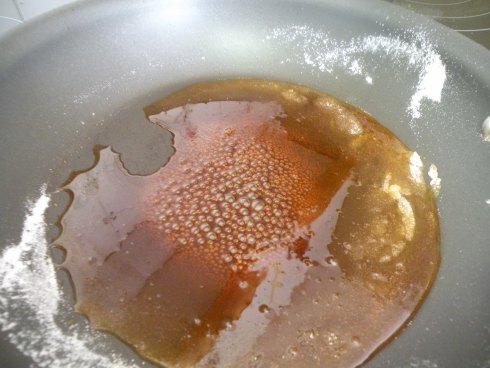 Watch the sugar until the color deepens and you have large bubbles (you don’t want to burn it). When it’s ready, lower the heat to medium and add the pieces of butter, stirring constantly. Once the butter is blended in, pour the cream into the mixture slowly. It will hiss and bubble and probably clump a little, but it will even out as you keep stirring. If you have large clumps, keep it on the heat and stir until they melt down a bit. Pour into a heatproof bowl and cool for about 10-15 minutes. While the caramel cools, make the rest of the filling. In a large bowl, whisk together the pumpkin, remaining 1/2 cup sugar, spices, vanilla and eggs until smooth. Add the caramel, pour into crust and bake at 350 for 45-50 minutes. You will know it’s done when the filling puffs and the middle does not jiggle. A knife inserted into the middle should come out clean. Cool on a wire rack. Will keep for 2 days lightly covered in the refrigerator. Enjoy!